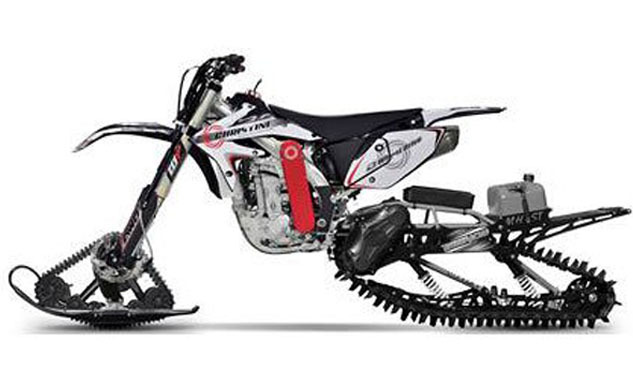 Christini All Wheel Drive Motorcycles have introduced their II-Track Snow Bike system for the dirt bike. It can be use as the snowy road conqueror for recreational or military purposes. The tracks system such as the chain tracks on the military tanks, it uses the Christini all-wheel drive technology. So the dirt bike which to be a model can be move on slippery or snowy terrain, because the tracks on the front and rear functioned as the driving force. Christini has patented the all wheels motion system. The system consists of a small snow tracks laid in the middle between a pair of skis to aid the buoyancy or to keep it not buried in the snow. The track is installed on the front fork, driven by Christini AWD systems on the wheel axle. A pair of skis in the front will adapt to a variety of undulating surfaces, such as heavy snow, mud and sand. And the front track also has a function as the dirt bike braking system.